Fira is the capital of the island. It is located high on the Cliffside and attracts many tourists due to the big shopping area, some small but outstanding museums, restaurants, coffee shops with a great view and its convenient location in the middle of the island. A famous Golden Street full of jewelry shops connects the cable car to the center of the town leading you to our Orthodox Cathedral, Metropoli, while behind the cable car our Catholic Cathedral signifies the beginning of the whole Catholic quarter. Fira became the capital of the island at the very end of 18th century and presents a mixed sample of Cycladic and Venetian styles. Consider it as the alternative to watch the sunset, especially at the end of October and in November, when the sun is sinking into the sea right behind Nea Kameni island making it shine in its golden rays. Fira is the closest place to observe the Volcano from Santorini, and definitely is one of the most preferable spots to watch our annual festival Ifestia taking place at the end of August or in September. Ifestia is dedicated to our Volcano Nea Kameni and includes an imitation of a volcanic eruption with help of fireworks. 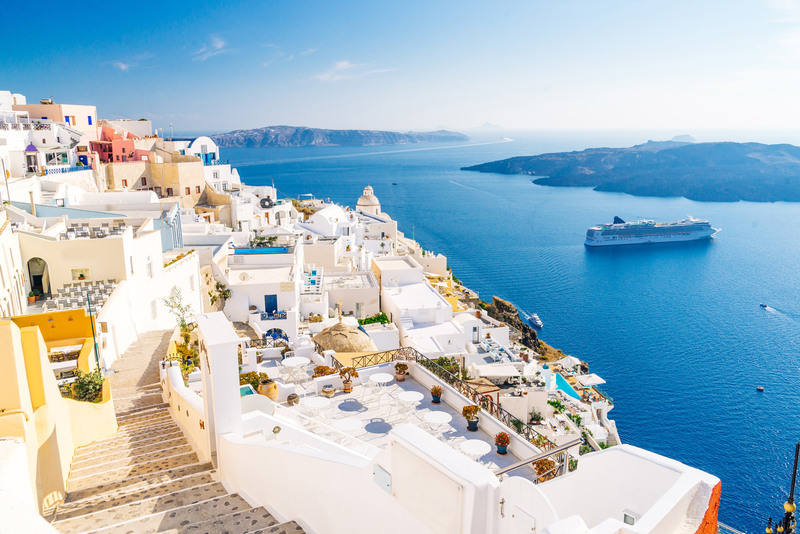 Going all the way up towards Firostefani you will find yourself at Nomikos Conference Center being rewarded by a fabulous view of Fira from above. Several steps further bring you to Nomikos Cava with a beautiful terrace overlooking the Volcano, Caldera and the capital – that’s where you can taste Santorinian wines and Volcan beer. The capital of Santorini is the center of night life of the island. Lots of small bars start inviting you from 9 o’clock in the evening while major famous night clubs open later on and entertain the guests till the first morning hours. When you get hungry after going out, come to the main square of Fira full of little Greek fast food places preparing souvlaki, pizza, crepes and more to satisfy all tastes. Metropoli is the main attraction of Fira and an easy-to-find place to meet someone. Its big, beautiful, white arches cannot be missed and form a nice background for your pictures. This remarkable church is a great sample of modern Cycladic architecture making the town much more special. A Catholic cathedral creates a pleasant contrast to the Orthodox Metropoli, fully rebuilt after the earthquake and now dedicated to Christ. Lazaristes’ Monastery behind it makes the Catholic quarters look more impressive. Megaro Gizi is another historical building located near the cable car built back in 1700. It provokes you to have a look inside, looking a bit strange in the narrow lanes of Fira. Megaro Gizi has been turned by the Catholic Monastery to a premise where many concerts are being held during summer. Some of the halls also act as a little exhibition presenting a part of the island’s history. 2 churches attract the visitors’ views when they overlook Caldera from the center – the dome of St. Ioannis and St. Minas church, being the oldest ones in these surroundings. Walking along the Cliffside of Fira, check its lower level, Kato Fira, too. Many stairs bring you to the whole world of beautiful corners and charming views, including two oldest churches of the town. Museum of Prehistoric Thira is a must to visit. Although closed on Tuesday and staying open only till 15:00, it is a treasury of most of the archaeological findings and impressive wall frescoes found during the excavations at Akrotiri (Lost Atlantis). It’s hard to believe your eyes seeing all the comforts and utensils people would use yet somewhat 3600 years ago. Every history lover will be greatly surprised visiting this museum. It adds to your whole impression of way of life and civilization development in the prehistoric town of Akrotiri once you have visited the excavations. The museum is located next to public busses’ and taxi stations. Archaeological Museum presents a collection of sculptures, figurines and pottery mostly from the town of Ancient Thira that gave the name to the island. One can find here lots of interesting stuff of a later period, mostly Hellenistic and Geometrical. It would be the first museum you meet on your way going out of the cable car building. Cable car is the only in its kind in the whole island. It was built on private funds and is the basic means of going down to the old port of Fira and up to the town (taking just several minutes in each direction). It is the easiest and the most comfortable way to get to Fira once you disembarked your cruise ship. The place has more practical use than something remarkable. Except of many small coffee shops suitable for both breakfast and after hours, ice cream, Chinese food, restaurants with local food – both on the square and around it, a pharmacy, banks and ATM, there is a big shop with tourist goods, stationary and even some clothes here solving some of your problems while in the island and saving your time. A department store (Hondos Center) is a couple of meters away from the square. This is the main port where individuals from the cruise ships disembark to visit the island. It is connected by 587 steps with the capital provoking many tourists to take a mule to go up to the town. A rather new means of transportation, our cable car, will take you to Fira much more safely and with comfort avoiding unpleasant smells and walking between the donkey’s surprises. From the same port ‘pirate ships’ are leaving to the Volcanic islands and Thirassia (offered as an excursion). If you decide to take a donkey (mule) to overcome a 260m height, we suggest doing it only on the way to Fira, not to get down (for safety reasons). Fira offers accommodation for all the budgets. You can find here luxurious hotels and suites descending down the Cliff with a fantastic view to the Volcano while at the same time there are hotels, rooms, pensions and apartments offering you all the basic comforts at low cost. Are there any beaches in Fira? Fira has no beach therefore for swimming you need to take a public bus or drive towards the seaside. The closest beach is in a 15 min. drive from the town.